I went to Virginia over the weekend to see the folks and had lunch at The Stray Cat in Arlington. This restaurant is a few doors down from its sibling cafe, The Lost Dog. I was there with my goddaughter, her mother, and HER mother. Much catching up ensued. 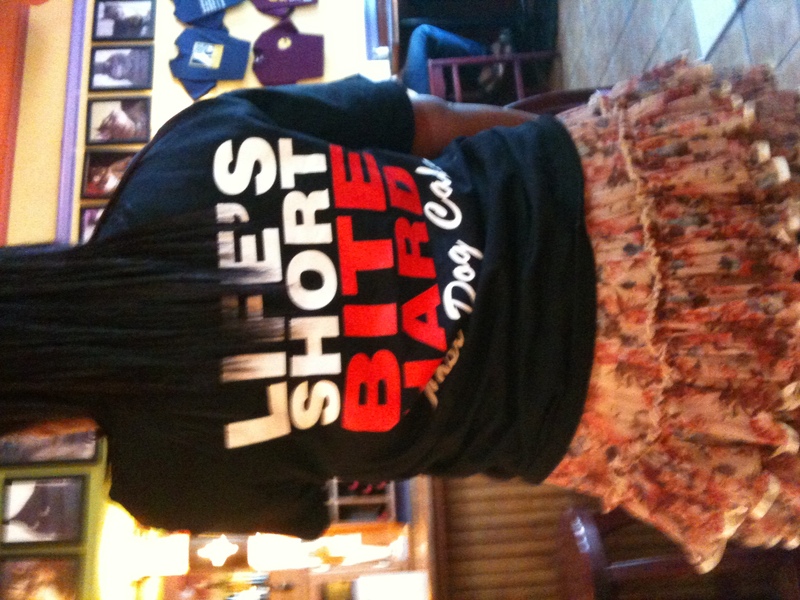 I fixated on the Lost Dog t-shirt that the hostess was wearing, proclaiming “LIFE’S SHORT BITE HARD.” My goddaughter fixated on the skirt and how it was attached to the rest of the outfit. (I asked, when I asked to take the picture. It’s a plain old skirt. Over black tights.) We all had salads, mostly Mediterranean with olives and shredded chicken. The vinaigrette with feta cheese dressing was especially good. I wonder what the t-shirt message equivalent would be for a cat? I suppose this would depend on the cat’s mood. On a nice lazy morning while lolling in the sunny spot on the sofa it might be, “Life’s Short. Purr loud.” On the occasion of being put in a carrier to go to the vet: “Life’s Short. Scratch deep.” When the dry food plate is empty, “Life’s short. Howl Incessantly.” Etcetera. Howling incessantly sometimes works and sometimes does not. When my cats howl they usually get their way. I on the other hand have no such luck. If you are a cat and you howl over your empty plate and the answer from your owner is, “I understand,” but the plate remains empty, what’s a kitty to do? Scratch deep? Not an option if de-clawed. Run away from home? Pah. It’s too warm in here. Sit in the corner with a pout, and personify the sourpuss? How inelegant. I would rather be purring loudly. Can someone please point me in the direction of the sunny spot on the sofa? I can’t seem to find it on my own today.